What if, instead of defiling your local school, church or train yard with just a few colors of spray paint, one can contained a near infinite array of expression? 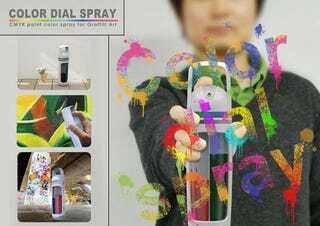 The Color Dial Spray is a refillable spray can design that contains all four base colors of the CMYK spectrum (cyan, magenta, yellow, and key black). When the artist rotates hue and brightness dials, the can tweaks the color mix accordingly, making selecting a paint color in real life just as easy as it is in Photoshop.